We officially reveal NSW and QLD Teams for Game 1! Well kind of... NOT The Footy Show delves into the minds of Stuart and Meninga and comes up with very little scoop for Origin 1. But we give you just about the most reasoned predictions you'll hear anywhere. 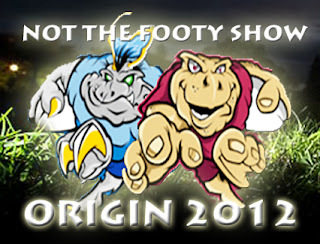 Join Warrick Nicolson and DC Chapman as they talk to Matthew Duncan and Maria Tsialis about all things Origin 1 and we preview Round 9 with odds guru George Taylor - all in NOT The Footy Show Episode 104. Plus Eyes reviews the latest NRL Footy Cards (Actually no he doesn't - his uncle forgot to edit his segment into the show! - Next Week for sure) and we have plenty of feedback from readers about our Origin article on www.wdnicolson.com and as always we preview your team's chances in Round 9, with our panel's tips and moderately anticipated Special Fried Rice selections. At just 90 minutes long this week - NOT The Footy Show lasts just about as long as the total minutes Kurt Gidley has spent on the field this season.